Thank you Tillamook for sponsoring this post. For a limited time this fall, try Tillamook’s Extra Sharp White Cheddar Slices! Available at Costco. 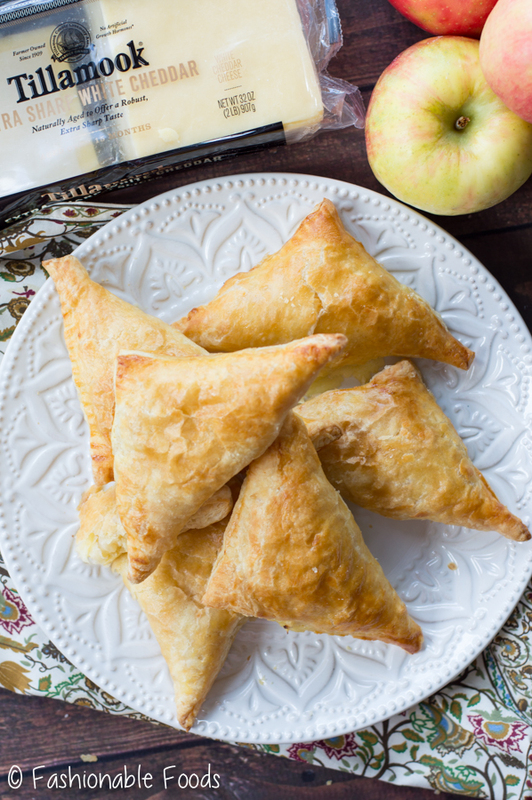 Capture the essence of the fall season with these tasty apple cheddar turnovers. 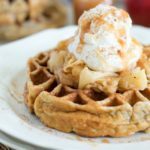 It’s a simple recipe that is perfect on a crisp day after apple picking or an elegant appetizer to accompany any fall meal. It’s finally starting to feel like fall around here, which means bring on all the fun fall things. Like my favorite fall activity: apple picking. There’s something so exciting about walking through an apple orchard and picking your own apples. And then coming home with all the fresh apples and dreaming up what to make? That gives me all the fall feels. So, what do we make with all those apples? Well, there’s the classic apple pie, apple crisp, caramel apples, apple dumplings, applesauce… I could go on and on. Maybe you’ve exhausted all of the classic options and are looking for something a bit different? Maybe a savory option? Well, I’m here today to show you the best way to use those fresh apples. You’ve heard of apple turnovers? Usually they have a sweet filling and maybe a glaze drizzled over top. They are delicious, but sometimes we want something savory and sweet. And one of my absolute favorite sweet/savory combinations is apple and cheddar. It’s seriously a match made in heaven! 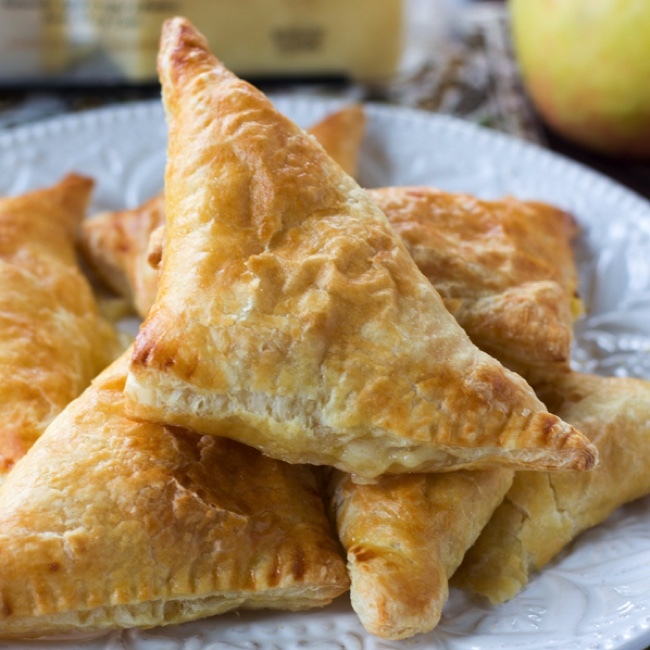 All you need to make apple cheddar turnovers are a couple sheets of frozen puff pastry, Tillamook Extra Sharp White Cheddar Slices, and fresh apples of course! 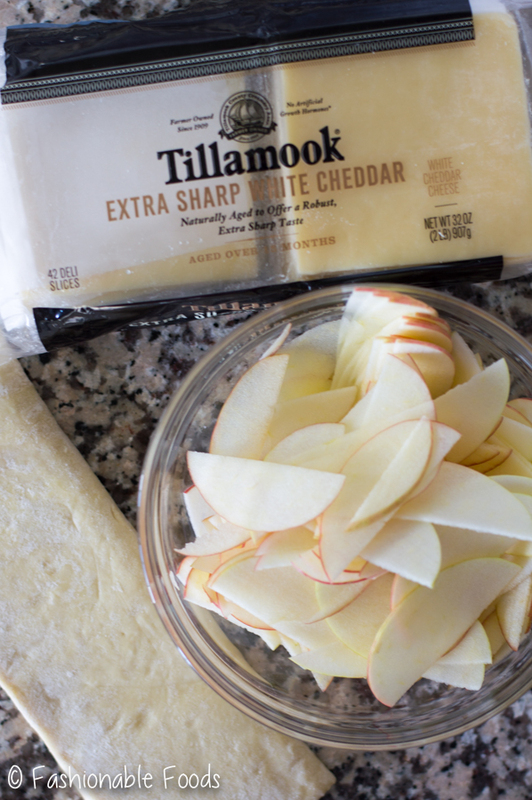 Before we jump into the how-to, let’s talk about those Tillamook Extra Sharp White Cheddar Slices. If you’re a cheddar lover like me, you’re going to love them! 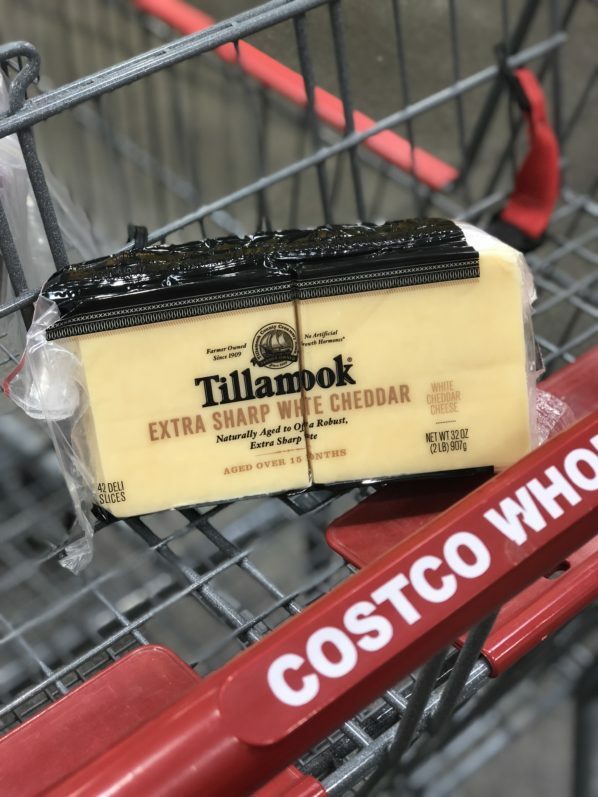 Tillamook Extra Sharp White Cheddar Slices are made with three simple ingredients and naturally aged for 15 months to achieve tangy perfection. 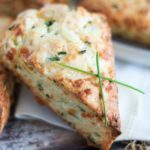 Tillamook’s creamy yet robust Extra Sharp White Cheddar Slices are the perfect addition to my apple cheddar turnovers. You can find the extra sharp white cheddar in two-pound packages at Costco, but only for a limited time through November! 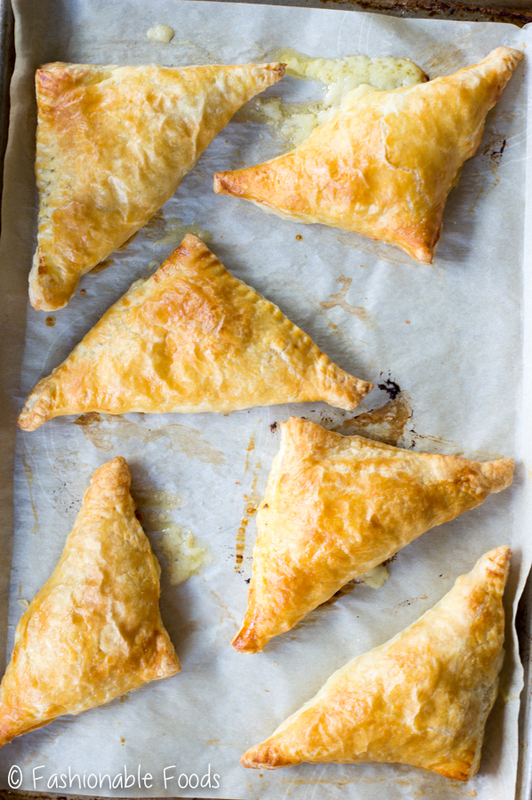 So get shopping (and apple picking) so you can make these delicious apple cheddar turnovers. If you’re intimidated by the thought of making turnovers, don’t be! With the help of frozen puff pastry and Tillamook Extra Sharp White Cheddar Slices, making them couldn’t be any easier! We’ll start by slicing our apples very thinly. Since these turnovers only bake for 20 minutes, you want to make sure the apples are tender. 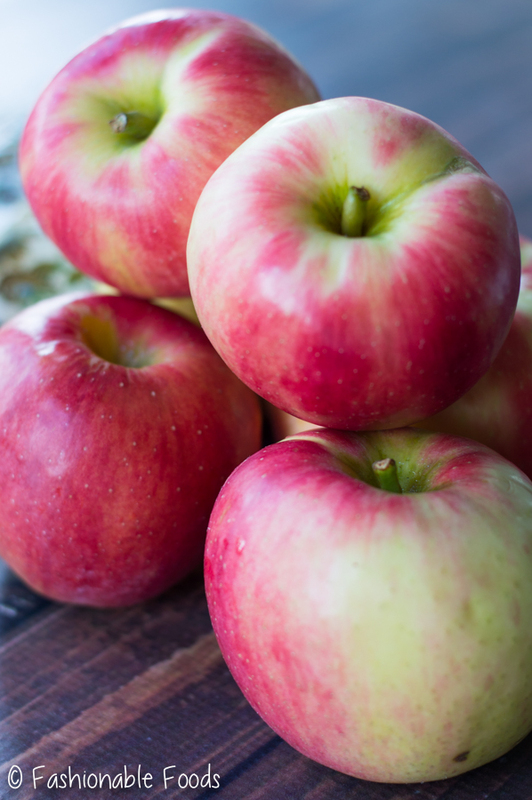 By slicing them very thinly and heating them on the stove until wilted, you’ll ensure that the finished product has perfectly tender apples. I recommend using a mandolin to thinly slice the apples, but if you don’t have one you can certainly do it with a knife! Just take your time and get them as thin as you can. Heating the apples first not only ensures they end up tender, but you’ll also be able to pile more into each turnover! Once the apples are wilted, set them aside to cool while you work with the puff pastry. You’ll obviously want thawed puff pastry, so make sure it’s pliable but still cold. Working with one sheet at a time, dust a work surface with flour and roll out pastry to seal the seams and so you end up with a rectangle. You want 6 equal squares out of one sheet. Use the extra sharp white cheddar slices as your measuring guide! Just lay them out on the puff pastry rectangle, leaving a one-inch border around each cheese slice. If you’re able to do that, go ahead and cut the squares and then you’re ready to fill with apples! The great thing about these turnovers (besides how easy they are), is that they can be made in an advance and frozen! This recipe makes 12 turnovers, but I chose to make 6 and freeze 6 for a later time. To do that, you just make the turnovers according to the recipe, but don’t brush them with the egg wash and don’t bake. Freeze them on a parchment lined baking sheet, and when they are frozen solid you can transfer them to a freezer storage bag. When you want apple cheddar turnovers, pull ’em out of the freezer, brush with egg wash and bake! It’s really that simple and you’ll always have a great fall appetizer at the ready. The puff pastry is flaky and butter, the apples are tender, and that cheddar is oh so melty. It’s just the perfect reward after a day of apple picking! These tasty apple cheddar turnovers would also make a great accompaniment to your Thanksgiving table. 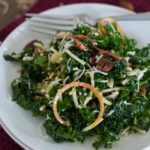 They are delicious alongside soups, salads, or just as a nice starter. No matter what the occasion, an apple cheddar turnover has a place! Trust me on this one – they really are that delicious! 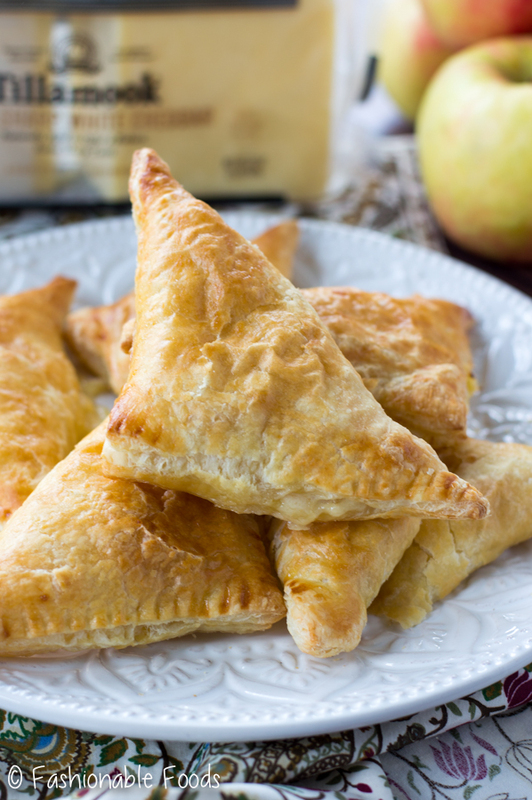 Capture the essence of the fall season with these tasty apple cheddar turnovers. It’s a simple recipe that is perfect on a crisp day after apple picking or makes for an elegant appetizer to accompany any fall meal. Core your apples and cut in half. Use a mandolin (or a knife) to very thinly slice each half. Add the apples to a skillet and heat over medium heat to soften. You just want the apples wilted to make it easier to pile them into the turnovers. Set aside to cool. Unroll 1 puff pastry sheet onto a work surface dusted with flour. Roll the sheet out a few times into a rectangle to seal the seams and to get 6 equal square pieces. Use the Tillamook Extra Sharp White Cheddar Slices to measure! You want the puff pastry squares to have an inch border around the cheese. Once your puff pastry is the right size, cut the squares and top each with 1 slice Tillamook Extra Sharp White Cheddar. Add a small pile of apples on one half of the cheese (you’ll have to use half of the apples for the 6 squares). Brush the edges of the puff pastry with the egg wash and then fold the corner on the side without apples over to the other corner with apples. Press the edges around the triangle and use a fork to seal. Transfer the turnovers to a baking sheet lined with parchment paper. Repeat the process with the remaining puff pastry, Tillamook Extra Sharp White Cheddar Slices, and apples to get 6 more turnovers. Place those on a second baking sheet lined with parchment. Brush the apple cheddar turnovers all over with egg wash and bake at 400º for 20 minutes or until golden and puffy. Let cool for about 10 minutes or until you’re able to handle them before serving. The turnovers are best served warm, but leftovers can be reheated in a 350º oven until warmed through. Unbaked turnovers can be frozen, just complete the recipe up to laying them out on a parchment lined baking sheet, but don’t brush them with the egg wash. Freeze on the baking sheets and once they are fully frozen, transfer to a freezer storage bag for long-term storage. You can pull out whatever amount you need and bake! Just add 5-10 minutes to the bake time.